240 pages | 3 B/W Illus. This edited volume reassesses the ongoing transnational turn in anarchist and syndicalist studies, a field where the interest in cross-border connections has generated much innovative literature in the last decade. It presents and extends up-to-date research into several dynamic historiographic fields, and especially the history of the anarchist and syndicalist movements and the notions of transnational militancy and informal political networks. 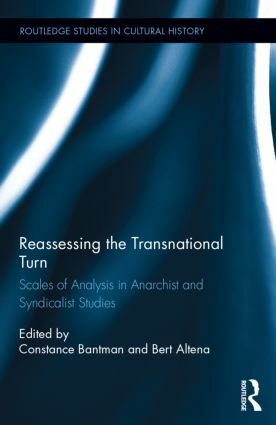 Whilst restating the relevance of transnational approaches, especially in connection with the concepts of personal networks and mediators, the book underlines the importance of other scales of analysis in capturing the complexities of anarchist militancy, due to both their centrality as a theme of reflection for militants, and their role as a level of organization. Especially crucial is the national level, which is often overlooked due to the internationalism which was so central to anarchist ideology. And yet, as several chapters highlight, anarchist discourses on the nation (as opposed to the state), patriotism and even race, were more nuanced than is usually assumed. The local and individual levels are also shown to be essential in anarchist militancy. Constance Bantman is lecturer in French at the University of Surrey. Bert Altena is a former lecturer at Erasmus School of History, Culture and Communication.